All my patterns feature: * Full size, computer drafted pattern pieces in all sizes specified that can be printed on a standard letter or A4 home printer (so no resizing is necessary) * All measurements in cm and inches. * Full, detailed, illustrated sewing instructions. * Instructions on how to print and piece together a tiled pdf pattern. * Home sewers may use Mountain Ash Designs patterns to make small quantities of garments to sell. This allows one home sewer to use a pattern they have purchased to make garments in their own home and sell them. * File for a full size pattern that can be printed at a copy shop if you don’t wish to tape pages together. Make your own festival pants in ladies sizes with this pdf sewing pattern from Mountain Ash Designs. 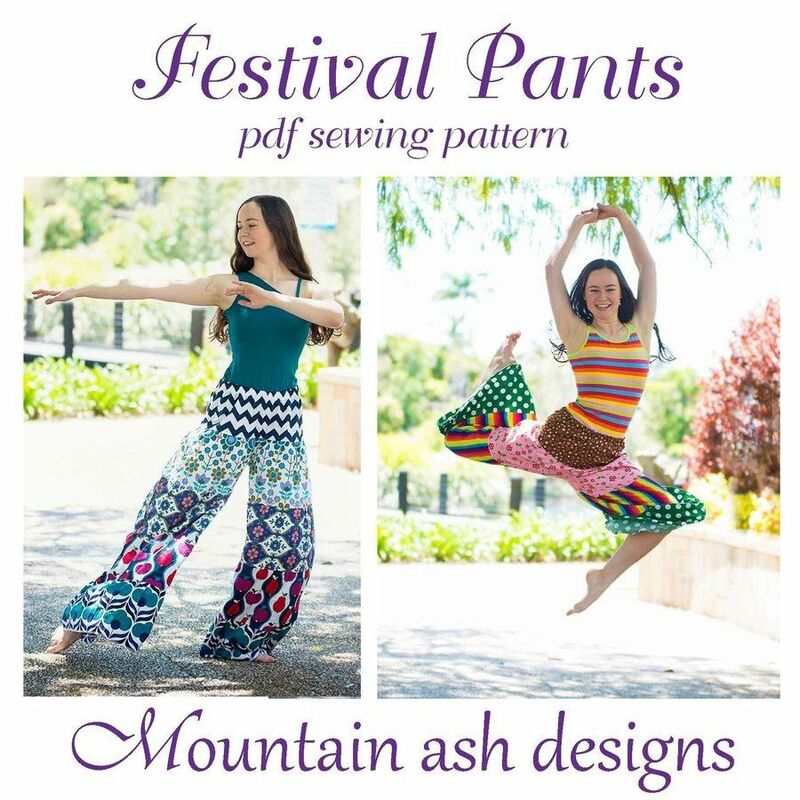 Whether you decide to hit the fabric store for the perfect blend of rainbow colours, or to embrace your inner hippy and make them in upcycled fabrics, or to raid your fabric stash for the perfect combination of fun and groovy prints, these pants are sure to be a favourite! Pattern provides options for full length flares or 3/4 length pants. Pattern also includes information on how to make these patchwork style for the ultimate fabric stash busting project.